As I begin writing this article, the 404th rhino has just been killed by poachers in South Africa this year. The current rate of poaching means that 1 rhino is being killed approximately every 12 hours, a completely unsustainable number and one that is still on the rise EVERY day. 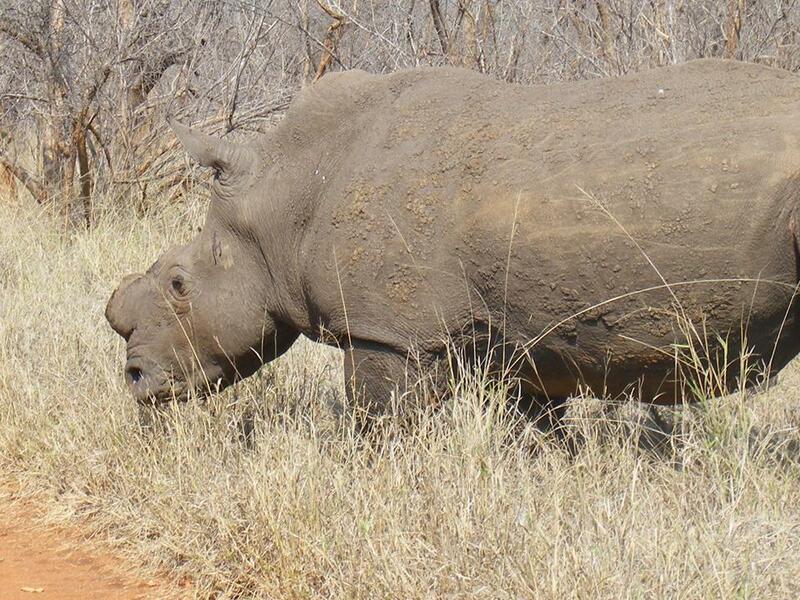 The owner and manager of Pidwa Wilderness therefore took the difficult decision this month to DEHORN our Pidwa rhino. The operation was carried out by a qualified vet with the Department of Environmental Affairs and Tourism (DEAT) also present. They are responsible for permitting and the micro-chipping of horns. ALL HORNS WERE THEN TAKEN OFF THE RESERVE TO BE STORED SECURELY ELSEWHERE. This blog post details the scale of the operation, which the Askari team took part in, and also gives further information on the rhino poaching crisis. We please ask for your help in spreading the word and sharing this article to make people aware of the plight of the rhino and also that the Pidwa rhinos are no longer a target for poachers. Within South Africa, the Limpopo province suffers the second highest number of rhino losses every year (after Mpumalanga) due to poaching. 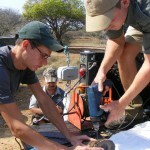 Reserves in our local area began dehorning their rhino at the end of 2010. While they reported great success and no further loss of rhinos, it pushed the poaching to other areas as organised criminal syndicates struggle to keep up with the high demand for horn from the Far east. 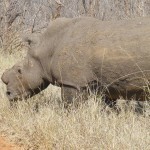 In the past few months, more than 10 rhino have been poached in the immediate vicinity of Pidwa as the poachers continue to seek out those rhino still with their horn. In the meantime, those reserves who dehorned not only suffered no further loss of rhinos but also saw a complete end to trespassing of any kind on their properties. It is quite clear that if your rhinos no longer have horns, they are not a current target for poachers. It was at this stage that we believed dehorning to be the best option available to us on Pidwa. While it seems invasive and extreme it appears, at the current time, to be the only way to ensure our rhinos stay alive. 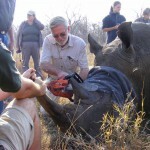 Dehorning a rhino requires the animal to be chemically immobilised, a procedure carried out by a qualified veterinary surgeon. 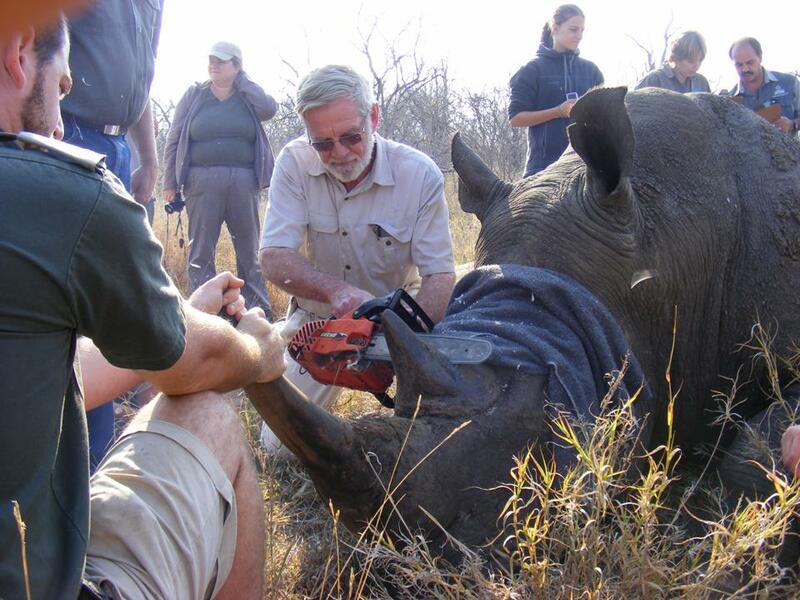 Also required is the use of a helicopter to find the animals and provide the platform from which the vet can dart the rhino. The operation started first thing in the morning to try and avoid the heat of the day. Dr Peter Rogers arrived with his team and also a representative from our local DEAT office to regulate the legal side of the operation. Dr Rogers travelled in the helicopter to first locate the rhinos and once close enough; the helicopter was lowered for him to take his shot. The pilot then carefully pushed the rhino as close as possible to a road. After just a few minutes the drug took effect at which stage we were called in as the ground crew. The eyes of the rhino were covered with a blindfold and then a marker pen and tape measure used to draw a line around the horn for cutting. A chain saw was used to remove each horn. 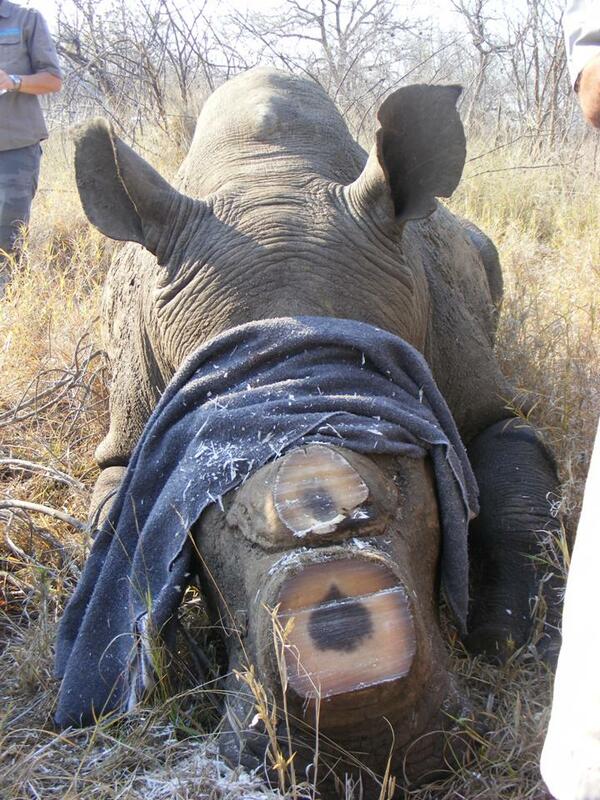 Both horns were removed from every rhino and then marked. 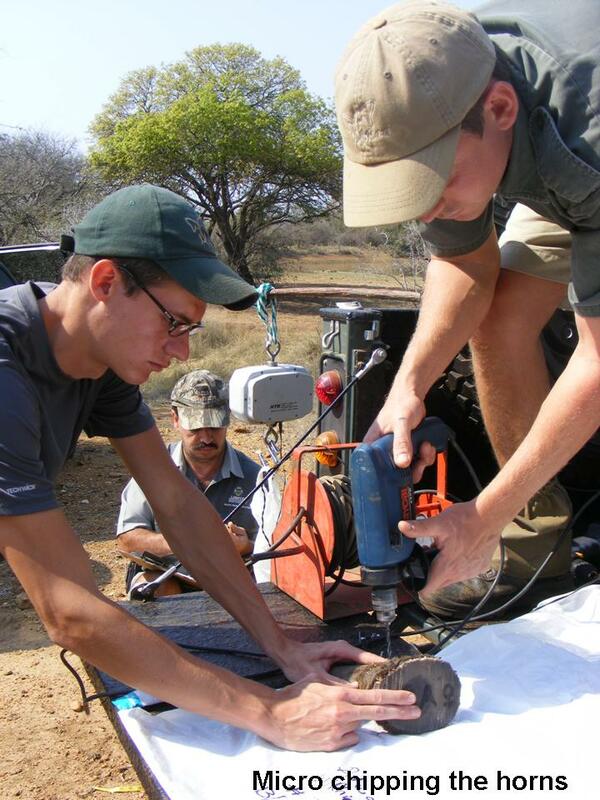 Each rhino then received ear notches for identification purposes and a number of DNA samples including blood, hair and tissue samples were taken. The rhino was then given the reversal drug and was back on its feet just a few minutes later. The whole procedure took less that an hour for each rhino after which time we went back up in the helicopter to find the next one and work our way through all the individuals. After all horns were collected they were weighed, photographed and chipped and then packed up ready for travel to secure storage off the reserve. Also present throughout the day was a film crew who came along to document the dehorning operation. Their footage will be making its way to Chinese television to try and hit the problem at the source of demand. Our dehorning operation runs alongside our continued heightened anti-poaching efforts including regular patrols, sleep outs and communication and awareness with neighbours regarding the movement of poaching syndicates. We will now advertise widely that our rhinos no longer have horns. Below we have compiled an overview of the rhino poaching problem and current information available. 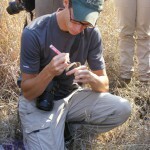 If you find this article useful and informative, please SHARE this link (http://www.askarivolunteers.com/recent-events-flash-news/de-horning-of-rhino-on-pidwa) with others via email, on facebook or your own blog to help us spread the word and also ensure that everyone knows our rhino on Pidwa are no longer of value to poachers. References are also available at the end which can provide further reading on the topic. Please be warned that some of the following images (obtained from the stoprhinopoaching website) include graphic pictures of poached rhinos. 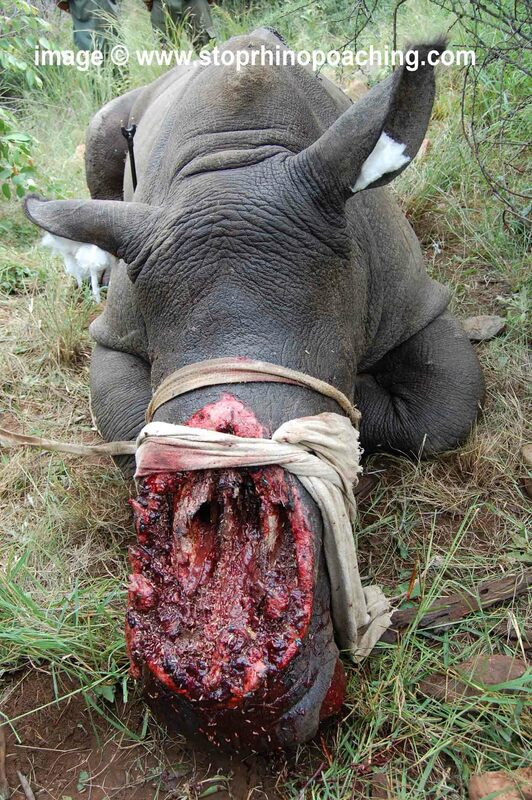 Rhinos are poached for their horn. 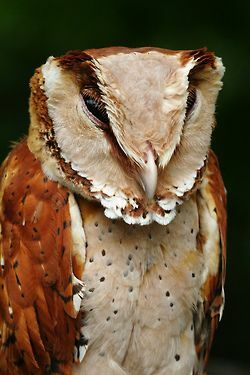 The horn is primarily made up of keratin, the major protein component in nails, horn, hoo ves, wool and feather quills. 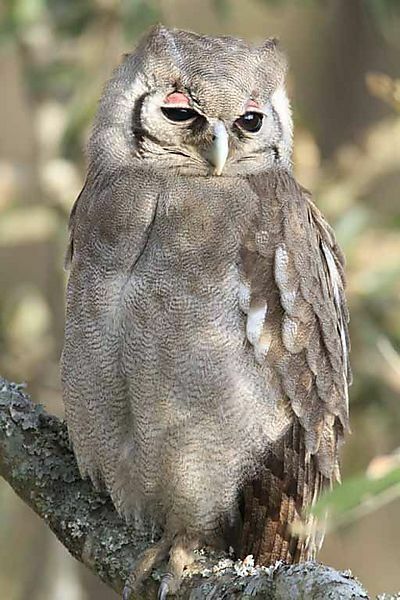 It also has large quantities of sulphur containing amino acids and large quantities of calcium in the centre of the horn. Rhinos are shot, or poisoned, or in some cases only anaethetised, while their horn is hacked off with an axe or panga or cut with a chainsaw. Because the horn grows directly from the nose, the poachers have no problem cutting into the flesh to ensure every last bit of horn is collected. In situations where the rhino was only under anaesthetic, it is then left to wake up and stumble around with half its face missing. The gun shot used to immobilise this rhino (right) did not kill him. 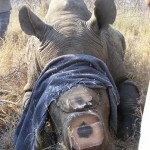 He was left in this state by poachers once they had taken his horn and only found 6 days later by reserve staff. He was euthanised following the discovery that his top lip was paralysed; the nerves controlling it having been cut off along with his horn. Rhino horn has been harvested for many hundreds of years but statistics only began in 1926. In fact during the 1930’s more than 500 rhinos were being killed annually, during the 50’s and 60’s around 600 each year and in the 70’s up to 1,180 rhinos died in each year of that decade. In 1987 participating parties at the CITES conference in Ottowa agreed to close down the trade of horn completely. 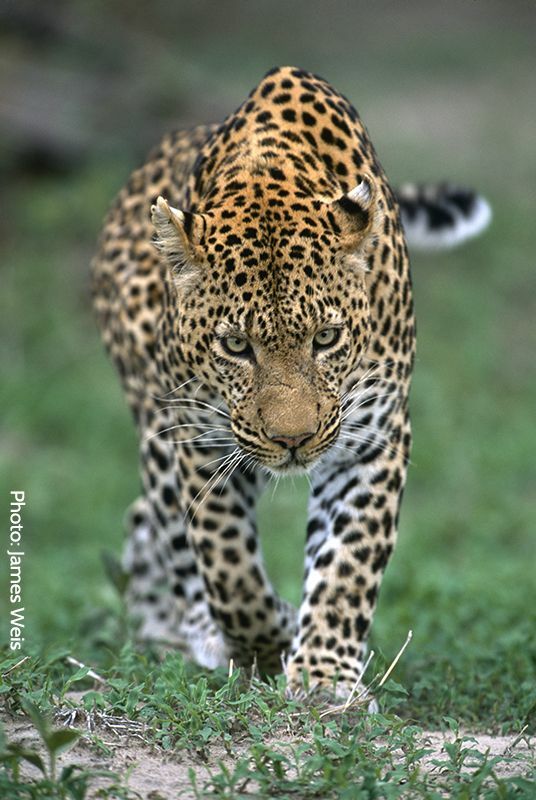 For a while, poaching subsided with less than 25 incidents per year at the beginning of the 21st century. In 2008 however, numbers were on the rise again and have increased every year since. These alarming numbers can be seen in the following graph. 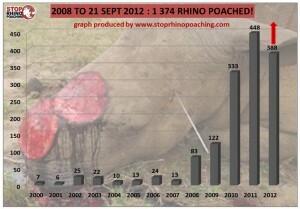 Figures for 2012 illustrate official figures which are only released at monthly intervals, hence the number of actual rhinos poached this year is already higher. Where does the horn go and what is it used for? The Far East primary consuming nations of rhino horn are Hong Kong, mainland China, Taiwan, Singapore, Japan, South Korea, Peninsular and Sabah Malaysia, Brunei, Macau and Thailand. Horn is also used in the middle-eastern country of Yemen. Here the horn is used for the handles of curved daggers called ‘jambiya’. These are presented to Yemeni boys at the age of 12 as a sign of the transition to manhood and devotion to the muslim religion. Chinas use of the horn for ornamental purposes dates back to the 7th century AD when they were used for carvings, belt buckles and paperweights. Now however, the main use for the horn across Asia is in traditional medicines. It is a common mis-conception that rhino horn is used as an aphrodisiac in Traditional Chinese medicines but in fact it is used to treat pretty much everything but! Ailments supposedly cured include fever, rheumatism, gout, and other disorders. It is also believed the horn could cure snakebites, hallucinations, typhoid, headaches, carbuncles, vomiting, food poisoning, and “devil possession.” Overall there is very little evidence, if any, to support the medicinal claims of the horns power. A Hong Kong university did discover in 1990 that extremely large doses of rhino horn could slightly lower fever in rats. The doses given by a traditional Chinese medicine specialists however would be nowhere near the amount needed and you might as well just chew your own finger nails! Additionally, it was also proven that Saiga antelope and water buffalo horn would do exactly the same thing The problem however is that those who use it, truly believe it works and this is shrouded within hundreds and thousands of years of tradition. How much is rhino horn really worth? Rhino horn is now valued at more per kilogram than gold. While gold is trading for around $49,665 per kilogram, a kilogram of rhino horn hits the black market inAsiafor between $50,000-60,000. What are the effects of dehorning on the rhino? Rhinos use their horns for defending themselves, their calves and their territory. They also use it for digging, foraging and displays. Although long term research has not been possible, it is believed that dehorning ALL rhino within a restricted area will prevent any problems associated with interactions between individuals. There is plenty of information on the web and from various organisations relating to the rhino poaching crisis. The following references provided information for this article and can be a source for further information. Daly, B.G., Greyling, A., Friedmann, Y., Downie, s., du Toit, R., Emslie, R., Eustace, M., Malan, J., Nghidinwa, K., O’Criodain, C., Trendler, K. (editors). 2011. 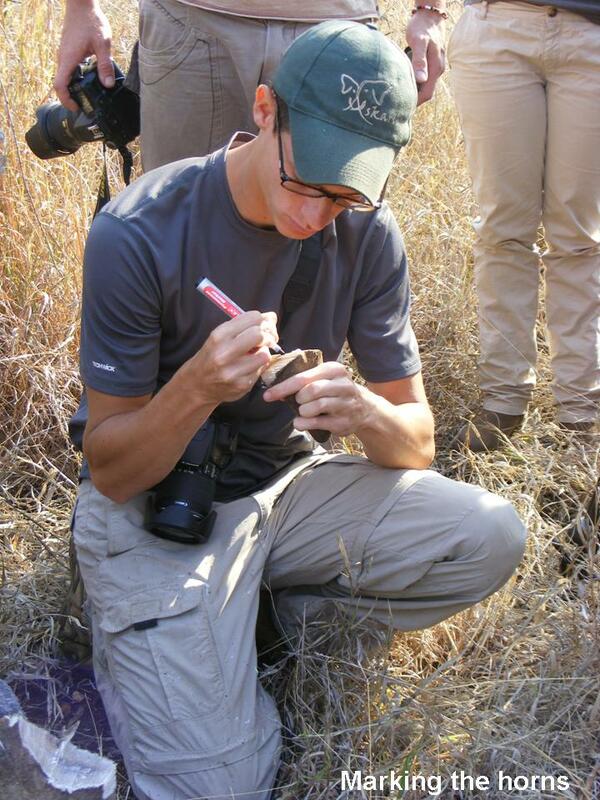 Perspectives on dehorning & legalised trade in rhino horn as tools to combat rhino poaching. Proceedings of a workshop assessing legal trade in rhino horn as a tool in combating poaching as well as a detailed assessment of the efficacy of dehorning as a deterrent to poaching. 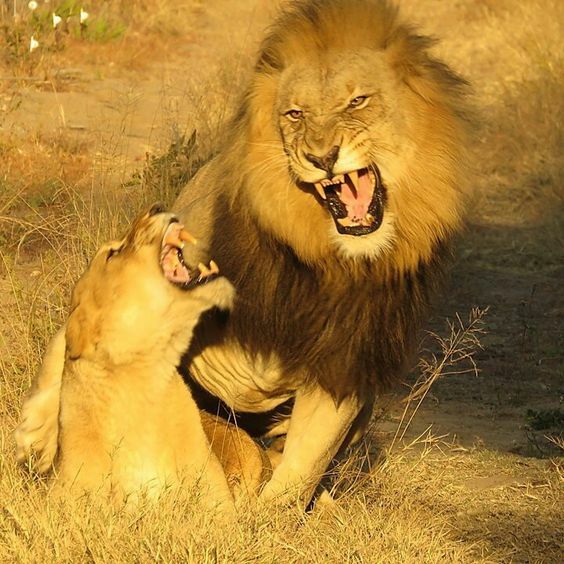 Endangered Wildlife Trust.Johannesburg. This is such a tragic state of affairs, but one which will continue if this kind of action is not taken. There has never been a point in my life where rhinos were not under threat and it’s amazing that they’re still surviving through all this brutality. I feel very fortunate that I was able to see rhinos as pointy and dangerous as they should be, but feel that without a doubt it is better to see a hornless rhino than no rhino at all. 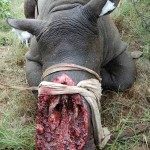 As sad as it is to see the rhino without its horns, it is certainly the lesser ‘evil’. It is horrific that they are savaged just to satisfy a material need for decoration, or for fallacious health benefits. We cannot just stand by and hope the problem goes away. Well done to all involved. Hi! I’ve been reading your web site for a long time now and finally got the courage to go ahead and give you a shout out from New Caney Tx! Just wanted to tell you keep up the good work! What a horrible world we live in. My heart breaks when I see those photographs especially the calf standing beside its dead mother. How does this poor creature survive. 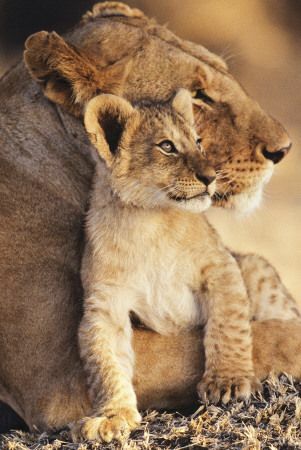 I have just finished watching Edward v111 the lion king documentary. The film footage where he is charged by a rhino and shot leaving her calf frightened and bewildered will stay with me for life. I was hoping that the film makers would have told the viewers what happened to the calf. This was filmed in the 1930’s so would the orphaned calf have been sent to a sanctuary to help its survival. I can’t imagine there would have been any help for the baby at that time. Therefore it would have been left to fend for itself while the king and chums drank their champagne and enjoyed the rest of the safari. I do hope I am wrong. 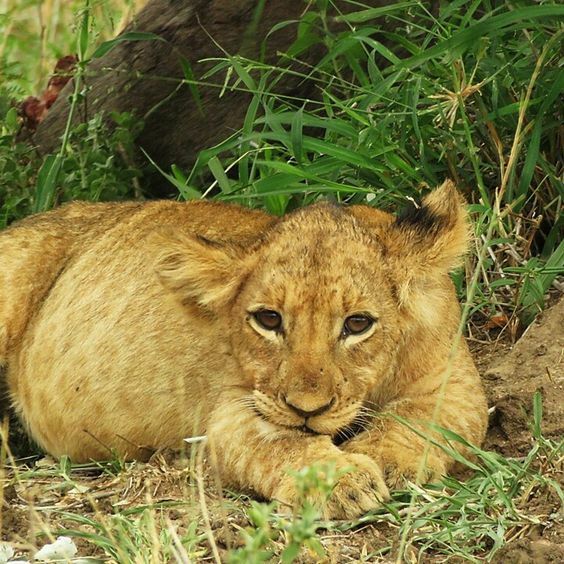 I would be extremely grateful if there are any wildlife experts who have watched the programme Edwardv111 the lion king. To give me some information about the orphaned rhino calf. I apologise I should say RECORDED information on the orphaned calf in te documentary, my apologies. Keeep on working, gfeat job! Greetings! Very heppful advice in this particular post!